Is getting the best dog repellent for runners on your mind? Am sure that are you trying to take a jog in the morning, but you’re being bothered by dogs chasing after you. It is annoying to have dogs disrupt your exercise routine. It is even worse to bear with a dog scratching your clothes or either biting you. The good news is that you can securely and safely keep dogs from bothering you during your workout by using a dog repellent. The best dog repellent for runners can help any person with keeping dogs away while also ensuring those furry fellows aren’t harmed. Why Do Dogs Chase After Runners? Dogs often chase runners to satisfy their prey drives. Dogs are domesticated descendants of wolves. Those wild animals hold the prey drive as a means of finding and hunting after food. This includes things that run fast. Such a drive has been critical to the survival of wolves throughout the years. Domestication has made it to where dogs do not have to chase after prey. However, the instinctual desire to chase after things is still prominent. The urge is the most noticeable when the targeted item the dog is interested in is moving fast. What Should You Do When A Dog Chases You? Stop running for a moment. Running will only cause a dog to become more interested in the chase. Avoid eye contact. The dog might take your staring as a challenge. Yell at the dog to sit or go home. The animal will become nervous as it hears your orders. The dog should leave you alone, although this works best in cases where the animal understands such commands. Bark back at the dog if needed. Do not be too loud when doing so. Barking lets the dog know that you are too dangerous to go after. Provide the dog with something to chew. A small bit of chicken, cheese, steak, or anything else the animal desires always helps. The chewing action helps the pet to relieve its stress, thus keeping you safe from possible harm. Use a dog repellent if you have one. The repellent produces a slight bit of discomfort so the dog will not try to chase after you. The irritation will be temporary and minor at best. What Should You Not Do When A Dog Chases You? Do not try to run faster. The animal will only keep running thanks to the challenge. Do not stare at the dog. You would give that pet the impression you are ready for a fight if you maintain eye contact for a while. Avoid screaming at the dog. Although it is alright to issue commands to the dog in a louder voice, being too loud will only make the animal think you are an easy target. Do not throw things at the dog. Any treats you give should be placed on the floor without throwing it too fast. Do not use a stick or other thing to shoo the dog away. The pet might think you are on the attack and will fight back. You can use a repellent by taking the product and spraying it directly in the dog’s eyes or mouth. This is to produce a temporary irritation that keeps the dog from getting closer to you. The best time to do this is when the dog is about 10 to 15 feet from you. Cover your mouth, and eyes if possible. Avoid spraying into the wind, or else the material will spray over your body. 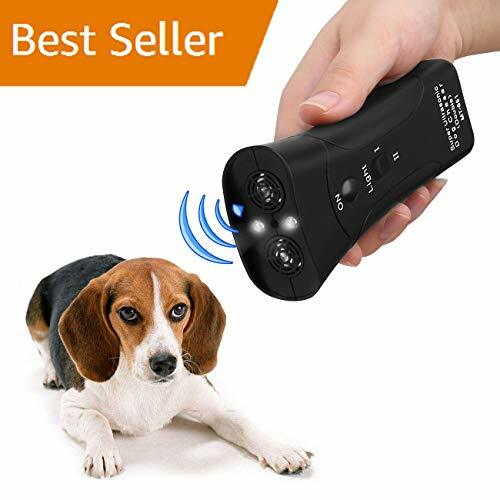 For an ultrasonic model, you would have to target it directly at the dog when that animal comes within the device’s range. The coverage spot may entail a range of 10 to 20 feet depending on the model. What To Look For In The Best Dog Repellent For Runners? A chemical spray can come with a scent that a dog does not like. Scents like pepper, citrus, or vinegar may be distracting and bothersome to a dog’s senses. An ultrasonic device produces sounds that are not audible to humans. However, those sounds are easy for a dog to hear. A dog may be bothered by the sound, thus causing that pet to move away from you. The repellent must be safe on the environment. Always look for a repellent that includes organic ingredients. These include spices, alcohols, and other items that are safe and will not pollute the air. The material also has to be safe for everyone especially dogs. Anything that has potentially harsh chemicals or additives might be dangerous to the pet and the person who sprays it. The range should be effective. You need enough of a range to target a dog before it gets too close to you. You should have enough sprays within the container. The number of sprays in the container will dictate how long you can use the material for before the compound runs out. The cost should be sensible. Deterrent products are not overly expensive, but it helps to watch for the value so you can find something you can afford to use. Your first choice for the best dog repellent for runners is Halt, a traditional spray. The device is a trusted solution that postal carriers around the United States use. Halt uses capsaicin, a pepper extract. The extract continues to how hot a pepper may be. The compound is a naturally-occurring irritant that produces a burning sensation in the mouth, eyes or other spots the material gets in touch with. The pains only last for a few moments, but they persist long enough to where the dog will not try to attack you any further while running. Halt includes a body featuring 99.65% inert ingredients with the remaining 0.35% including capsaicin. The mixture produces a light concentration where the capsaicin will not be too intense but still creates a firm body. You can use this by aiming the nozzle at a dog and spraying when the dog is about twelve feet away. The spray generates a direct stream that spreads out well and targets the dog in moments. Another useful spray choice, Sabre is an all-natural solution. The spray provides a firm body that keeps dogs away. Sabre includes 1 percent capsaicin, the highest strength that can be utilized according to EPA rules. The total works well for large breeds that might be tough to control. More importantly, the spray does not produce long-term harm as you use it. The small canister sprays at up to 12 feet from your body. Each unit produces about fourteen one-second bursts and will prevent a blowback from occurring. A safety lock is included to prevent the canister from accidentally spraying. The securing feature is triggered by twisting the nozzle. A key ring is included on the top part of the can. The ring provides you with quick access to the spray when needed. The canister comes with a four-year shelf life. The long life ensures you will have enough spray to work with even if you’re in an environment where dogs might not always be around. Now that we have talked about some spray repellents let’s look at some ultrasonic models. The first one of these to see is this model from Instecho. The Instecho repellent works mainly for dog training intentions. The tool also works for when you are trying to repel dogs while running. The device works with a few steps. You would point the trainer directly at the dog coming at you. You must stretch your arm out all the way for the best results. You will then give a verbal command and then press the button for one to two seconds. The dog should be bothered by the sound and will move away in a moment. The repellent uses three power settings. The Chaser setting is for when you’re trying to repel dogs chasing after you. The Light and Train options are for dog training intentions. The switch is located on the top base part of the training tool and provides a simple interface for use. There are two kinds of sounds produced by the repellent tool from Hoont. One of them is only audible to dogs. The second can be heard by people and animals alike. The remote includes a button for ultrasonic sounds that are irritating to dogs but are inaudible to people. A second button is for sonic sounds that utilizes a lower frequency. The sound is easy for people to hear, but it still produces an irritating sensation among animals. However, that sonic tone is best for cases where the dog is smaller or if the dog is not running too fast. 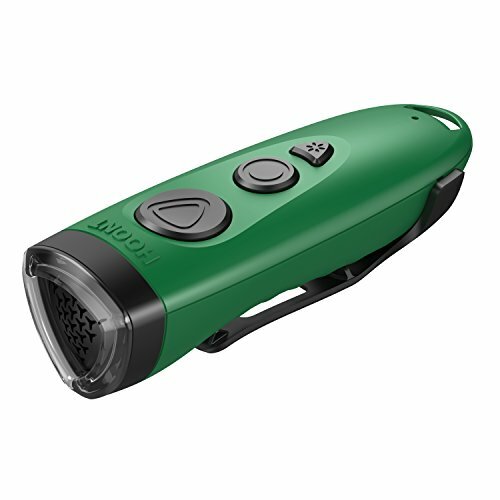 The repellent uses a rechargeable lithium-ion battery. A USB cable works for recharging purposes. A six-bulb LED flashlight is also included. The flashlight blinks while using the sonic sound option. The added light scares the dog away. A small clip fits on the side. You can affix the clip to your running shorts or pants. Your last option for the best dog repellent for runners is this model from Meter.llc. The design is powerful enough to control pets of all sizes. There are three controls on this repellent product. 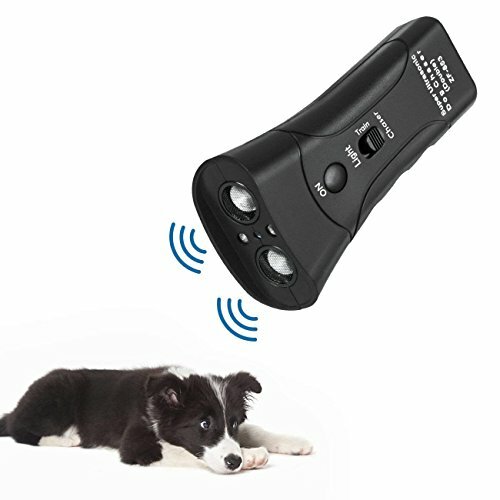 The Light option produces a flashlight that alerts and surprises the dog. The I setting works for basic training. The II option is for when a dog is chasing you while running. Use the small lever on the base to switch between modes. You can stop your dog from jumping or leaping on people. This includes cases where your pet tries to paw strangers at random. The top part includes two small LED bulbs and two ultrasonic sound channels. The design produces enough power to fend off dogs from 60 feet away on average. The design includes a small series of grooves on the side. The grooves provide your fingers with room to rest. The design produces a firm body that lets you focus on the best possible aim. The device is battery-powered and runs off of a single 9V battery. The compartment that you add the power source is easy to access and open. The battery will also stay in its place well after you load it in the unit. You need to look at how well the best dog repellent for runners can work for you. 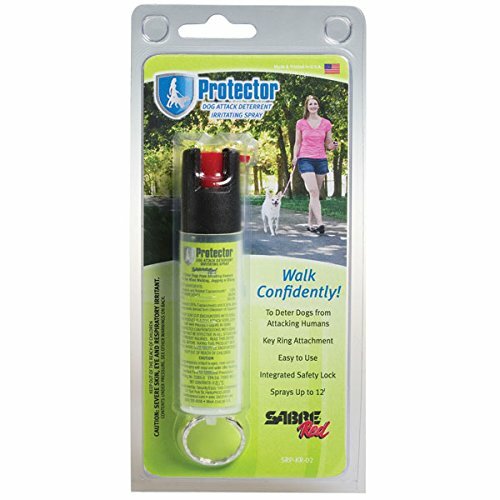 The best choice for you to see based on our reviews and its features is the Sabre Dog Spray. Sabre produces a firm body that is easy to carry around. The nozzle can lock to ensure you don’t accidentally spray anything. The protective body also keeps the spray from blowing back. Best of all, the Sabre spray is highly effective. The material can work well against any dog that might try chasing after you. Try this out when finding something that is easy to utilize during your next run.